Tag Archive | "Foliage gardens"
(BPT) Gardening is a peaceful activity that eases tension, reduces overall stress and promotes longevity. One long-term study found that daily gardening reduces the risk for both dementia and Alzheimer’s disease. With all of these benefits, there are ample reasons why people of all ages and lifestyles should start digging in the dirt. Foliage plants are no longer just accessories for your small space garden. You can create an entire display simply out of rich, colorful foliage plants. Fountain grass, papyrus, vinca and grassy rush are all great additions for adding vibrancy to your container garden. Mix and match with various textures to find a unique display that speaks to you. 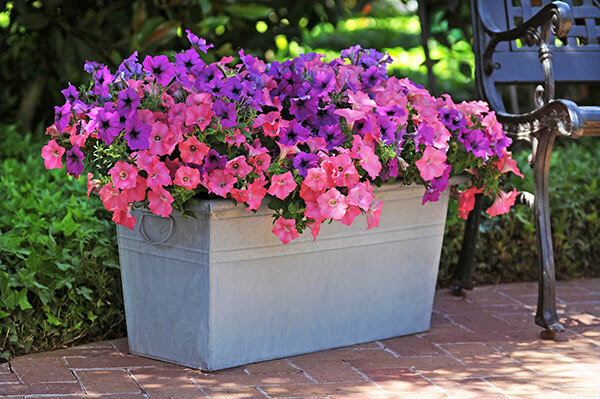 A petunia tower is a great way to add an unexpected element to your container garden collection. A flower tower is easy to make and sun-loving Tidal Wave Petunias will bloom all season long on a patio, deck or pool area. You will need only three Tidal Wave plants. The Red Velour have great color and texture and make a strong statement. Plant them with good potting soil into a 10 to 12 inch wide plastic nursing pot. Place a three-foot metal tomato cage into the pot. The cage should be as wide at the bottom as it is on the top. Now slip the entire plastic pot into a glazed pot that’s about one to four inches wider, and voila! Hanging flower baskets bring your plants to eye-level, where everyone can enjoy their wonderful scents and sights. Add beauty to an otherwise dull porch, wall or rafters. Try planting succulents for a virtually care-free container garden. Petunias, calibrachoa and pansies also make wonderful additions to hanging baskets. Who says your container garden can only have one plant? Get creative and play with different color and texture combinations of plants and flowers. You can make up your own mix or search online for combo recipes by other inspiring gardeners. 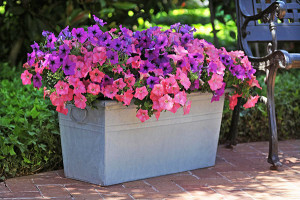 Mix foliage with flowers and use a color scheme to build a balanced and beautiful container. Take your favorite hobby inside. Even if you have a small apartment, there’s no need to rule out house plants. Find the best place for each plant, depending on their light requirements. Don’t be afraid to experiment and try different locations until you find the best spot for your indoor containers. For sun-loving plants, just be sure to place them on a windowsill for maximum light exposure. With so many options and room for creativity, container gardening is a trend that’s here to stay. Tap into your inventive side to build a container garden that brings joy and wellness both indoors and out. For more gardening ideas, tips and tricks visit wavepetunias.com.